Excerpts from Industry Experts: Planning an Impactful Event - Innovation Loft | UNLEASH YOUR TEAM’S POTENTIAL! Communication is essential to have an impactful and successful offsite corporate event. With a strong agenda, you can incorporate the use of bright colors, brain games, and quirky ice-breakers to stimulate conversation, which promotes brainstorming. 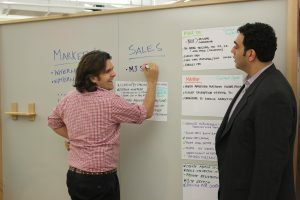 Cut back on tunnel vision by providing your participants with all of the collaboration tools and canvas space they need to get their ideas out of their heads, and onto paper, such as whiteboards or hypertiles. For any successful event or workshop it is important to have your attendees on the same page. 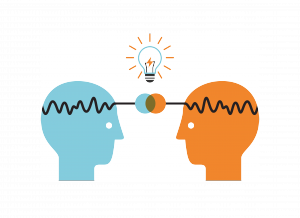 Move the brainstorm forward while working together and bounce ideas off of one another to make progress towards reaching a common goal. Stress the importance of listening during workshops or events. Not one participant knows it all and everyone should listen to what their colleague has to say during a brainstorm, regardless of experience or title. 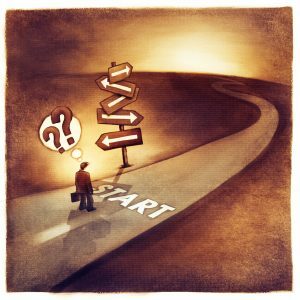 The right input will make an idea flourish and bring you a step closer to achieving your goal. While many may consider illustrations secondary, don’t underestimate the power of vibrant, eye-catching images in putting on a truly unique event. In addition to providing a burst of color, visuals can help immensely in connecting the dots and illustrating the speaker’s points. The right visual elements ensure that your most salient points will resonate with attendees, as nothing complements a strong message like a visually-pleasing photo or illustration. What happens when you stimulate communication? People get animated, creative, and more likely to speak their mind or share their ideas. Remember, you never know who or where the next “big idea” will come from. Visit How Industry Experts Overcome Challenges for more high value information from event industry experts on how to overcome some of the greatest challenges when planning an event! If you have any other inquiries about our space or services, please don’t hesitate to email info@innovationloft.com or give us a call at 646-692-3522.